Level Field: Malaysian team in A-League? A Malaysian team playing in the Australian League (A-League) can become a reality for the 2017 season. Former Australian international, David Stuart Mitchell, has been given the mandate by an Australian A’League consortium to look into a team from Asean region to compete in the A-League but first preference going to Malaysia. The former Selangor players and more recently Kedah coach, when met last week said that he has already mentioned the proposal to the Football Association of Malaysia (FAM) and is awaiting their feedback. “While he agreed that it would be difficult for FAM to send a team to the League because of the duration and also to assemble the national team for fulltime, he said there are other ways to go round the problem,” said Dave as he his known in the football circle. Dave said teams like Johor Darul Ta’qim (JDT) or Selangor – two teams who are very professional, have a huge following and big names in Malaysian football – can consider competing in the A-League. “JDT already has a second team in the Malaysian League, thus they send their first team to compete in the A-League. Selangor has to assemble a second team to play in the M-League while the first team plays in the A-League. Dave said that logistically it will not be a problem because Australia teams already travel long distances to play in the A-League. “Infact, it is faster to travel to Malaysian then some parts in Australia. “Cost wise it will not be an issue as a substantial subsidy is given to participating teams besides travel also taken care of by the FA. “The Malaysian team travelling to Australia can play two matches in a trip. 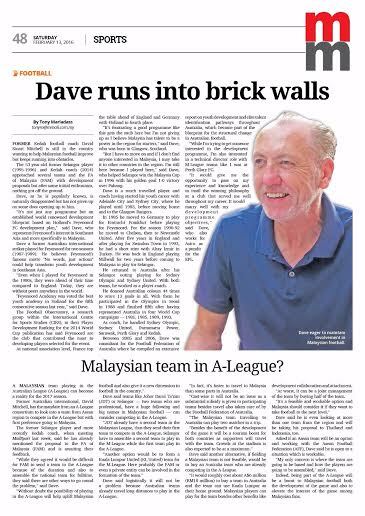 Dave said that another alternative if fielding a Malaysian team is not feasible, would be to buy an Australia team who are already competing in the A-League. “It would roughly cost about A$6 million to buy a team in Australia, and the team can use Kuala Lumpur as their home ground. Malaysian players can play for the team besides other benefits like development collaboration and attachment. “At worst, it can be a joint management of the team by buying half of the team. Dave said that he is even looking at more than one team from the region and will be taking his proposal to Thailand and Indonesia too. Asked if an Asean team will be an option and working with the Asean Football Federation (AFF), Dave said he is open to a situation which is workable. “My only concern is where the team is going to be based and how the players are going to be assembled,” said Dave. Indeed, being part of the A-League will be a boost to Malaysian football both the development of the game and also to elevate the interest of the game among Malaysian fans.